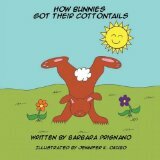 Ever wondered how bunnies got their cottontails? Well, according to Barbara Prignano, they didn’t start out that way. When a little boy decides to cut down the time on his chores, he accidentally gives the bunnies their cotton tails. In How Bunnies Got Their Cottontails, we find out the story behind those tails. The idea behind this book is cute, since kids love bunnies and especially their tails. But this story lacked substance, and the illustrations were too simplistic. I would have preferred if the way the bunnies had gotten their tails had been a little more involved, with some interesting and fun plot twists. Kids would find it more engaging, and could then read it more than once.